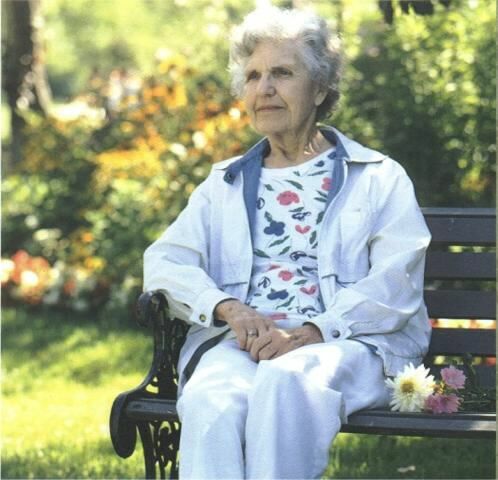 This is a photo of my mother sitting outside at her retirement center, Tudor Oaks, in Wisconsin. After graduating from university in Wisconsin, my mother went to Colgate Rochester Divinity School where she met my father. Besides raising two wonderful (ahem!) daughters, she was a junior high English teacher and a librarian. For a number of years, she worked at the American Baptist Association headquarters in Valley Forge, Pennsylvania. All her life, she continued to be a dedicated member of the church, often playing the organ for services and sometimes giving the sermon, including one called Knowing God with Our Hearts. In Pennsylvania, she met Cliff Martin, her second husband, and "inherited" five step children. Cliff passed away shortly after she moved back to Wisconsin. She had two younger brothers, Kermit, who lives in Texas, and Kenneth, who lives in Florida. Since she was raised in Wisconsin, she had a number of relatives and friends there from her childhood whom she enjoyed visiting from time to time. She loved traveling and, besides numerous trips all over the U.S., also took trips to Hawaii and Japan. With her keen interest in health food and daily exercise, including walking and playing golf, my mother was the model of a well-rounded, energetic woman. For more about her life, read Homestead Days. Also, see Places I Have Lived . Last updated August 8, 2005.